Many major disaster declarations are due in whole or in part to flooding. But communities can adopt various corrective and preventive measures to reduce flood damage. The coastal flood risk reduction course incorporates floodplain management practices, and participants learn about the traditional structural and nonstructural mitigation approaches to reduce risk, increase opportunities for prevention and increase resilience. The coastal flood risk reduction course is offered through the National Disaster Preparedness Training Center and taught in local communities throughout Washington state. It provides an overview of the flooding risks to coastal built and natural environments, in addition to introducing capabilities (approaches and tools) that can support coastal prevention and mitigation, preparedness, response and recovery. In its partnerships with communities working to prepare for climate change, WSG has found that local-scale assessments result in local action and planning that improves resilience. State climate change projections suggest that Washington’s coastal communities will bear the physical and ecological brunt of rising ocean temperatures and sea level, more frequent storms, hydrologic changes to freshwater systems and other impacts. WSG staff actively work with coastal communities to assess their vulnerabilities to climate change and develop adaptation plans that can reduce their risk over time. 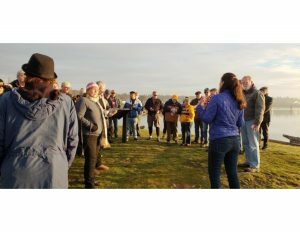 WSG offers courses on planning for climate change, facilitates or conducts vulnerability assessments for communities and constituents, and promotes and conducts applied research to identify climate impacts in coastal Washington. Western Washington is susceptible to a diverse range of natural hazards ranging from common threats such as coastal erosion and flooding to rare but potentially catastrophic events such as earthquakes and tsunamis. Local, state, federal and tribal governments have invested in hazard-related research and management, but planning and coordination remain limited. Partnering with the Washington Department of Ecology, WSG has developed a statewide Coastal Hazards Resilience Network, that connects researchers, agency experts, planners and communities. The network transfers research findings to communities, encourages incorporation of lessons learned into community planning, and facilitates more effective mitigation, response planning and community awareness. Ecosystems, infrastructure and people will be impacted by the phenomenon of climate change and rising sea levels. The King Tides Program and community events inform coastal dwellers about twice-yearly extreme tides. Citizens’ photos of king tides are posted on the website.The website helps local communities and decision makers visualize the challenges we will face as the climate changes. With climate change comes impacts to our coastlines from storm surges and rising sea levels. Planning for climate change is an important priority for Washington’s coastal communities. For professionals planning ahead to address sea level rise, WSG specialists offer a course through the Coastal Training Program. Course materials include adaptation tools and methods, flood impact and risk-reduction planning, climate-change and sea-level-rise communication strategies and inundation mapping strategies. Courses are taught in conjunction with NOAA’s Office of Coastal Management. Pacific Northwest communities face many climate risks to their health and wellbeing. This project assesses vulnerability of coastal and fishing communities experiencing ocean changes such as acidification and shifting species distributions. Outcomes help communities and decision makers prepare for critical challenges, including strategies to strengthen resilience, minimize vulnerability, and protect and restore marine ecosystems. Key initiatives include surveys, focus groups and participatory risk assessments with several Washington communities whose wellbeing is tied to marine resources. Information about social and cultural variables such as food security, cultural practices, livelihoods and a community’s sense of place help to identify anticipated and cumulative threats. WSG has teamed with state and federal agencies working at the forefront of tsunami research and outreach to help prepare Washington coastal communities for the next tsunami. Washington is vulnerable to tsunamis from both local and distant earthquakes, and there is geologic evidence for past tsunamis in many Washington locations. Because of this, tsunami hazard awareness and planning is a number one priority for community resiliency. WSG’s coastal hazard experts Ian Miller and Carrie Garrison-Laney collaborate with state and county emergency managers and maritime groups around the state and give public presentations focused on education and preparation. 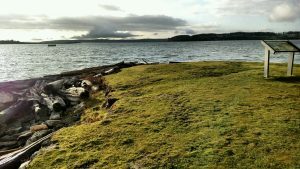 Through research and outreach, such as mapping tsunami deposits and promoting a Western Washington “Tsunami Trail,” WSG builds public awareness and scientific understanding of this paramount coastal hazard. WSG staff link the NOAA Pacific Marine Environmental Laboratory’s tsunami modelers and research to end-users in the community. Users include the U.S. Coast Guard and the Washington Military Department’s Emergency Management Division. WSG supports their efforts to plan effectively for natural hazards. Carrie’s work is partially supported by Pacific Marine Environmental Laboratory Liaison funds.